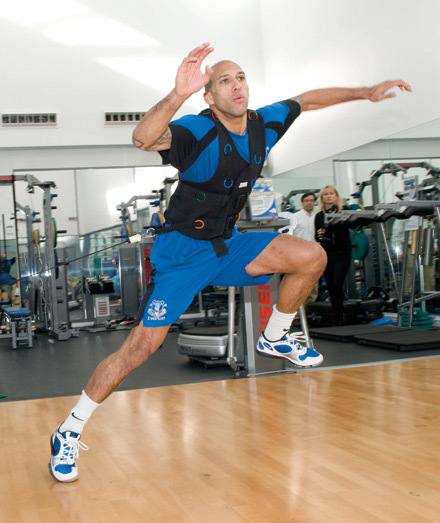 How did Team USA goalkeeper Tim Howard condition with his team Everton FC to become the "Secretary of Defense?" Thanks to our friends at Maximuscle, we were invited to Everton Football Club to meet their heads of Sports Science and Strength and Conditioning, Dave Billows and Steve Tashjian, for a behind-the-scenes look at their Finch Farm Training Ground and to learn how they help make their players stronger, more powerful, more agile and less susceptible to injuries. I started playing football as a youth player for local clubs in Southern California and my career continued through the university level where I developed a love for strength and conditioning. After finishing my football career and my undergraduate studies at the University of California, Long Beach, I earned a graduate degree in Physical Therapy from Western University of Health Sciences in California. I was lucky enough to be introduced to Jim Liston early in my career who hired me as a physiotherapist and strength and conditioning coach at his facility, the Competitive Athlete Training Zone (CATZ). Jim was the head fitness coach for the LA Galaxy at the time, and under him I gained experience assisting him with the Galaxy and treating athletic injuries in his facility. Through this work, I met Galaxy head coach Sigi Schmid. I left CATZ in 2003 to start my own facility in San Diego, California—Rehab United Physical Therapy and Sports Performance Center. However, in 2007, I received a call from coach Schmid who had since taken the head coaching position for the Columbus Crew of MLS. It would be my first head fitness coach position and it proved to be an amazing three seasons, winning three trophies during my time there. 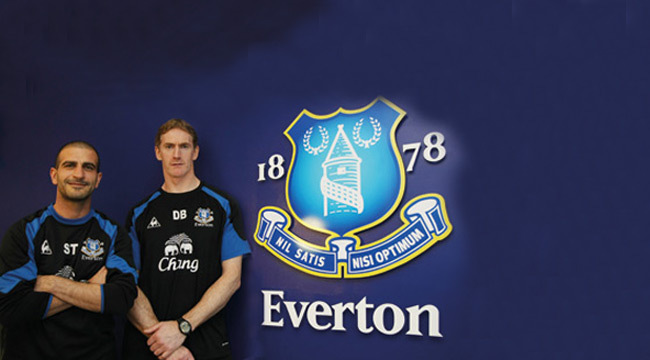 After spending several pre-seasons with the crew abroad, here at Everton, I received a call from Athletes’ Performance, the company responsible for the training of the German national team, asking me if I would be interesting in taking on a senior fitness coach position at Everton with Dave Billows, and I’ve been here since August 2009. MUSCLE & FITNESS: Having worked in Major League in the US and the Premier League in the UK, how would you describe the different S&C practices or philosophies between the UK and the US? STEVE TASHJIAN: It has less to do with an American or British philosophy; it has more to do with the philosophy of the individual managers. I think there is probably a greater managerial emphasis league-wide on S&C in the US than the UK. I certainly had a lot more contact with the players on the field in the US than I do here in the UK. ST: Athleticism has a greater contribution to success in Major League Soccer (MLS) than it does in the Premier League. That is mainly due to the difference in the level of technical skill between the two leagues. Although the skill level in the MLS has risen dramatically over the past 15 years, it takes a tremendous amount of physical ability to deal with the constant loss of possession. When watching an MLS match you will see a high work rate from each team to win the ball back but each bout of team possession is shorter compared to premier league teams. This results in multiple periods of collective pressing followed by short periods of possession over and over again. In addition, the multiple losses of possession also lead to a greater number of tackles and challenges. That makes physical strength and stability extremely important. Managers in MLS are well aware of all of these factors. That’s why they have a greater tendency to depend highly on the role of the fitness coach. When I was 17, I started playing semi-professional football, though I still had hopes of breaking into the pro ranks. I realised one of the main things was to be the best athlete I could be, so I started looking into training methods to make myself quicker. I started athletics training at Liverpool Pembroke, picked up some good training methods,and decided to study it more deeply. I did a few courses with the British Weightlifting Association and became a S&C fitness instructor, then an Olympic weightlifting instructor. I was then able to apply the knowledge with some of the football players and athletes I was working with, and then moved into training rugby players and boxers. While playing semi-pro, I completed my football coaching badges and began coaching for Everton at their summer camps and later, at their School of Excellence. After a few years of S&C coaching experience, I went to Liverpool’s John Moores University in 1997 where I earned my degree in Sports Science and Exercise Physiology. Once qualified, I was given the opportunity to join the academy at Everton where I completed my Research Masters, using academy players as subjects After three years with the academy, David Moyes asked me to work with the first team and I am now in my tenth season at the club. M&F: How would you differentiate between how football players train versus the way rugby players train? DAVE BILLOWS: There’s a big difference. Rugby has a greater emphasis on strength and power, and building a massive body is seen as a positive move, whereas in football, the need is to increase strength and power while minimising increases in bodyweight. Football managers want players to be powerful and agile but also light and graceful. This is obviously possible but much more difficult to achieve. The efforts of sports scientists and S&C coaches in football are starting to win through. Players are now realising that they can become faster, more powerful and more agile without being turned into huge, hulking monsters. 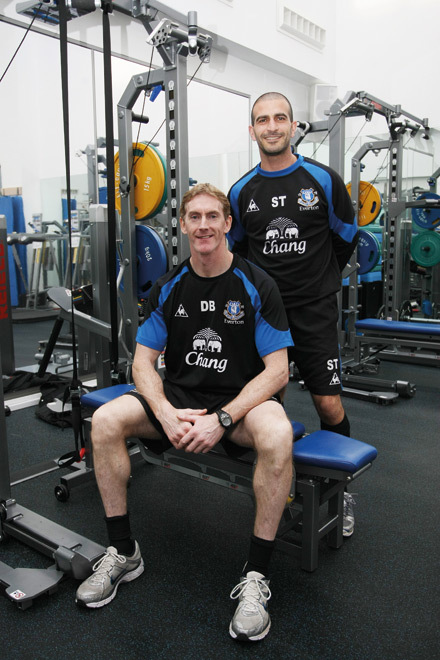 M&F: This amazing Finch Farm facility is a very obvious indication that Everton has a strong belief in S&C. 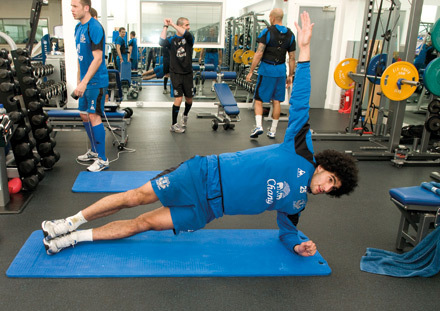 Where would you say Everton ranks out of all the premier league teams in terms of its S&C program? ST: Ranking it would be difficult. Every club has very similar problems, every club has some similar successes. A lot of it lives and dies from the backing you get from the manager and the buy-in you get from the players themselves. We dedicate ourselves to putting out a training program that we know will help the athletes’ long-term future, and we try to influence the players into taking an interest. No club has 100% buy-in. Some players don’t do anything at all, some prefer to do their own individual workouts that they’re comfortable with and others do whatever you say. We’ve found that once the players try our sessions they usually want more and fall in love with the results! DB: The facility is as good as any in the premier league and it illustrates our commitment to the players in optimizing their physical and physiological development and reducing their injury risk through use of the latest training techniques and cutting edge equipment. We are always looking for new ideas and technologies to enhance the performance levels on the pitch. M&F: What are the exercises and programs that increase a player’s strength and power? ST: It takes time and patience to make a player premier league-ready and the time frame will be different for each athlete. We build up a program starting with the basics when they first arrive. We start with a modified “functional movement assessment” which checks alignment, stability, and right-to-left equality. We just want to make sure we screen out any major issues due to medical history or range-of-motion issues in a joint before we can do a full-body strength and power session. We start with ground-based exercise and as the player gets fitter we up the tempo and try more unstable and complex exercises. Good core stability is not just about abdominal strength; it is a collective stability that starts from the tips of your toes and ends at the top of your head—that’s the core zone. It starts with your feet making contact with the ground which is in contrast to a lot of the popular “core” exercise that start supine or prone. Our favourite exercises are ones that are ground-based, use multiple bases of support and challenge all three planes of motion. If we are pressed for time, which most premier league teams are, we go straight to the transverse plane, or rotation movements. A great exercise example of this is the “split stance X-chop”. Rotation is a major part of speed and cutting and stability. Proprioception (the sense of the relative position of neighbouring parts of the body) and central nervous system reactions translate to better function. Combine this with speed and power work and you will have the ingredients for a complete athlete. M&F: The exercise you had Tim doing with the vest, designed for explosive power, jumping at angles—how does that work from a functional strength and power progression perspective? ST: With Tim, that exercise is less for vertical jump improvements and more for multidirectional stability and power. When they land they’re having to absorb their own bodyweight, plus the momentum of falling sideways and the 5.5 kg of extra weight all in single leg. It’s a fantastic multijoint exercise that challenges the base of support and requires control in multiple planes of motion. This is not an exercise for a beginner. It is an exercise that comes farther down in the progression. M&F: The Keiser machines—I’m familiar with the brand but I’ve never seen them spec’d out to that level before. What is the technical/electronic wizardry doing for you? 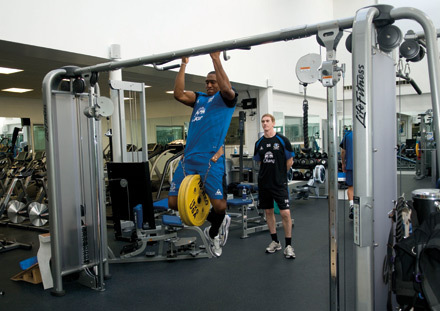 M&F: So this would seem to be a perfect example of how work in the gym can positively affect performance on the pitch. Can you please elaborate? DB: Force = mass x acceleration. If we want to increase the power output or force that a player can generate we must increase their rate of force development or the speed at which their muscle fibres contract. We can do this by increasing the weight they are moving whilst maintaining the speed of movement, or by moving the same weight at a greater speed. It is important to develop this force production in both a concentric and eccentric mode, as the greatest forces a player will encounter are applied during deceleration in order to change direction. An example of this can be seen when we do speed and agility tests. Some guys are very quick in a straight line but that doesn’t mean they will be the best at the agility tests. In a straight line they may be mechanically fluent and efficient and therefore fast, but they may not have the strength and power to decelerate and accelerate in a controlled and efficient manner. Eccentric and concentric work enhances this ability and improves a player’s agility and (just as importantly) their resistance to injury. M&F: What are you using GPS vests for? ST: Each pod tells us the distances each player is covering in a given training session. It also breaks down how much distance is covered at different speed zones. An accelerometer located in the pod also gives us a numerical value that represents the amount of change of direction and joint load each player endures throughout the training session. When tracked over time, we’re hoping that we will start to see predictable trends that will help us better prepare for matches and predict when an athlete is at risk of injury. While the GPS devices can’t be worn at any official games, we do use them in pre-season friendlies and reserve matches. In addition to the GPS pod, each player is wearing a heart rate monitor so that we can access the cardiovascular load of the session. When you combine these two sets of data, heart rate and physical load, we get a very useful tool for maintaining our team fitness. (First in the Premier League) 30 degree and 40 degree slopes and 11 inch and 24 inch steps. M&F: Do you use these in addition to working in the gym? DB: Yes, it is a great addition to our armoury for increasing the acceleration and power of our players. ST: But normally not all on the same day as it depends what we’re working on. Some people need it more than others at different times. Sometimes we pull sledges, sometime we use the ramp. M&F: Tell us about the benefits from using this type of apparatus. ST: We really want the players to work on explosive acceleration for the first 10 yards. The ramp gives us an opportunity to really stress the joints and stress the musculature. This apparatus and the drills we do gives the players the proper amount of resistance for the physiological and performance changes that we want. Players work at maximum speed for one rep and we give them as much recovery time as they need. It’s not an endurance workout, it’s purely “nervous system training” and this type of work needs lots of recovery between reps.
DB: You could do quite a range, maybe 6 reps on each side (the 30 degree and 40 degree ramps) and 2 to 4 minutes rest in between, then three single-leg hops up the 12 inch steps and 3 two-legged bounds up the 24 inch steps. We use it during the later stages of pre-season and sporadically during the season. We like to vary the functional power workouts as much as possible-we use plyometrics, the ramp, bungee cords and sled-pulling. We vary the workouts to stress the body in slightly different ways to benefit the players on the field. All the workouts are specific to the individual player’s training needs. 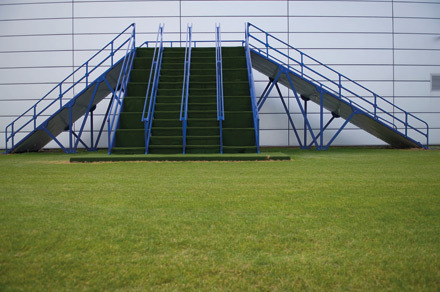 M&F: Are speed results really measurable using the ramp/stairs and have you tested it over 40 meters/40 yards? DB: You will certainly see changes over the first 10 yards of a sprint. To maintain that speed over 40 yards requires muscular endurance and sprint technique work. ST: Previously when we have tested pre/post-season and found improvements it was due to a combination of all the training. It’s difficult to say that the improvements were primarily due to one form of training or another. If your mechanics improve, and your stride length and stride rate improve, your speed will improve. M&F: What do you have the players do for post-match or post-intense training recovery? DB: Post-match we put them in ice baths at 9 to 10 degrees celsius for six minutes to help reduce the microtrauma and accelerate the onset of recovery. While they are in the bath, we give them their recovery drinks (Maxi-Milk and a carb/electrolyte mix). The day after a game we will start with some cardiovascular work at 60% to 65% HR maximum for 20 minutes: jogging, spinning or swimming and then stretching. Sometimes we do yoga to help drain the lymphatic system, then we move onto hot and cold baths (two minutes in each for 3 cycles). Good nutrition is vital with good quality carbs and protein—Maximuscle provide us with this in a simple and effective ready-to-use form. Most of the players will eat breakfast and lunch here at Finch Farm. The menu consists of the usual: fresh fish, chicken, as much organic fruit and veg as we can get into them and wholemeal cereals. We also always recommend good quality sleep as it’s vital for optimal recovery. M&F: In terms of sports nutrition, which of Maximuscle’s products do you use? DB: Mostly ready-to-drink protein (Maxi-Milk) and protein bars (Promax), VIPER energy drinks (pre-training), Maxipower (pre-match) and sports vitamins. It’s difficult to get all your nutrients from normal food when you’re training at such a high intensity. They need 2 to 3 times more RDAs than an average person. Some players also take Maxi EFA for omega 3s, Ache Free (Maxinutrition’s glucosamine product), BCAAs and some antioxidants. Occasionally we give them a B12 injection, usually around Christmas. M&F: How does training in the gym help your performance on the pitch? TIM HOWARD: At this club we’ve found it to be vitally important—there is a direct link on match days. It prevents injuries too. At this level everyone has excellent skills so if you can set yourself apart and gain an edge by extra training it’s worth it. M&F: Is there one particular exercise you feel assists your position better? TH: All the explosive movements and anything that works the core are important for a goalkeeper. The position is very reactionary—things are done quickly and you don’t have much time—so the explosive power is your most important tool as a goalkeeper. M&F: You are perhaps one of the smallest goalkeepers in the Premier League, so you must have high explosive power to be at the top of your game. TH: I’m not a monster for sure! My athleticism has always been one of my main attributes but I have to spread myself quite big to get to the corners. I try to do the most explosive exercises I can, and that all starts with the core. M&F: Did you play any other sports before you got into football? TH: Basketball, which is great for explosive power, stamina and endurance. M&F: Has the work you’ve done here with Dave and Steve positively affected your performance on the pitch? SYLVAIN DISTIN: It helps a lot. I try to have a routine of two hours at least three times per week: one upper body session for strength, one leg session for power, maybe using plyometrics or the ramp, and one session with the cable attached to the Keiser machine, which is mostly stability and core work. Sometimes I also try to integrate a boxing routine. I like to try different stuff and try to make it more fun which releases tension for me. M&F: I was watching your plyometrics session today and your leaping ability is incredible. How do you think the plyometrics training has affected your ability to jump that high or have you always been gifted in that way? SD: I have always been an athletic player rather than a technical player. I keep improving and working to improve my strength. I’m getting to an age now where my physical ability might start to go down but I have been injury-free for the last three years, I feel stronger on the pitch, more comfortable and I know this training is working. M&F: Your career has brought you from Paris-St Germain to Newcastle to Manchester City to Portsmouth to Everton. How does the S&C program here compare to the S&C at the other clubs? SD: I didn’t have much at Newcastle and Manchester. I started a bit of work on my legs but I wasn’t doing it regularly. I properly started S&C at Portsmouth and carried the work to here. Dave and Steve are two great guys—they really complement each other and the team. All the other clubs have the facilities but they don’t force you to do it, it’s down to the players to use them. When I was in my 20s I didn’t think I needed it, but when you reach 30 you take longer to recover from the game and I knew I needed to work harder at my S&C routine. M&F: According to a survey we recently ran in the magazine, the average age of our readers is 35. What would you say is the best recovery strategy for athletes of your age? SD: I just adapt my work depending on the week and when I’m playing. I try to do hard, heavy work at the beginning of the week and from Thursday it’s more core work with a bit of boxing. It’s important not to work your legs too much and keep it weight-free on the days leading up to a game. I take protein and vitamins as part of my routine—it works for me. M&F: How long have you been taking sports nutrition products? SD: About three years, since I started here. I take protein shakes and multivitamins from our sponsors Maximuscle. I definitely feel a difference—maybe it’s because of my age or the type of game I play. When you start taking things, you don’t feel the difference after a few months, it’s a long-term thing. Now after three years I can see where I am and where I was. You could say it’s luck but I believe it works for me!